Treasures of South Florida Libraries. Wolfsonian Foundation. De Stille Kracht door Louis Couperus. The Wolfsonian Foundation, founded in 1986, supports the study of European and American cultural history from 1885 to 1945. It conducts research fellowships programs, traveling exhibitions, and other educational projects at its museums and research centers in Miami Beach and Genoa, Italy. The Wolfsonian oversees the Mitchell Wolfson, Jr. Collection of more than 50,000 examples of political, decorative, and design arts in media ranging from furniture and architectural fragments to rare books and ephemera. This work, with a binding made to look like a fascio, was commissioned by Mussolini's Italian Fascist Regime in 1937, to extol the virtues of its occupation and colonization of AOI (Africa Orientale Italiana, or Italian East Africa). Established by decree on June 1, 1936, Italian East Africa contained a population of approximately twelve million people. It consisted of the Red Sea colony of Eritrea, the Indian Ocean colony of Somalia, and the former empire of Ethiopia (also known as Abyssinia). Mussolini was unsuccessful in subjugating the East African colonies and on January 20, 1941, Ethiopian patriots and British forces entered Ethiopia. On May 5, 1941, Haile Selaissie re-entered Addis Ababa and the Fascist colonial empire collapsed. The symbol of the Fascist Movement, the fascio, derives from an ancient Roman term for a bundle of rods bound with an ax. The ax, with its projecting blade, serves as a sturdy weapon. Minor Roman officials known as Lictors carried these devices to clear the path in front of chief magistrates as they marched in processions. In Italian the word fascio means group or association. A literal translation is bundle. The term was in use long before Mussolini adopted it for his movement. During the Fascist regime in Italy, the fascio became the official emblem of the state by decree-law on December 12, 1926. Faruk I, King of Egypt. King Faruk Match Book Cover Collection. Nine volumes; 8,001 items. Cairo, Egypt. This unusual gathering of matchbook covers was collected by King Faruk over a number of years. It consists of 8,001 mounted matchbook covers, arranged under headings for 88 countries, and bound in nine volumes. The United States is represented by 1,704 covers; Japan has 3,232 pieces; Egypt, 463; Sweden, 285; and Belgium, 278. King Faruk, 1920-1965, served as King of Egypt from 1936 until he abdicated the throne on July 26, 1952. Most of his treasures and personal collections were dispersed at an international public auction held in Kubbah Palace, Cairo, Egypt, in February, 1954. This collection and a group of razor blade package covers were acquired from a London antiquarian dealer in 1988. D. Veeze Collection. These three pieces form part of the D. Veeze Collection, a compilation of approximately 2,000 Dutch books, periodicals and ephemera. The book collection complements another extensive collection of Dutch calendars, with many artists represented in each collection. 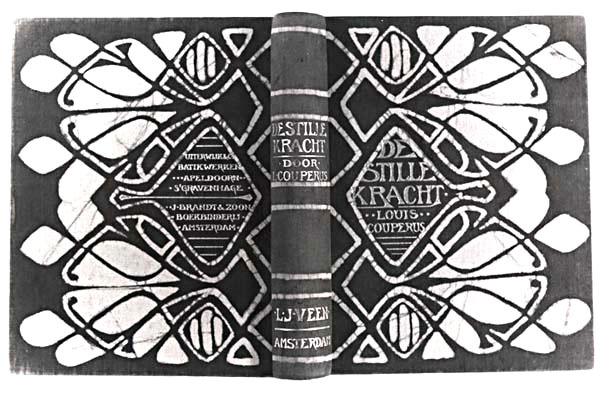 The majority of items in the D. Veeze Collection are books published between 1892 and 1910, and the bindings are a fine representation of the Dutch Nieuwe Kunst (Art Nouveau) Style. The collection, originally assembled over a twenty year period, was acquired from an Amsterdam art and antiquarian book dealer in 1992. It offers a comprehensive view of authors and binders, with variant editions of many titles. Although many of the individual works may be found in selected libraries, this collection offers a wonderful opportunity to examine fine bookbinding in a single location. Louis Couperus. De Stille Kracht door Louis Couperus. [Vols. 1 - 2]. Amsterdam: L.J. Veen, [n.d.] Psyche door Louis Couperus. Amsterdam: L.J. Veen, .